Hypernatremic dehydration – extreme dehydration – has been in the news lately and many mothers may have been left feeling concerned and confused by some of the ideas offered about breastfeeding in the early days, in particular that all babies need topping up with formula. Evidence shows that hypernatremic dehydration, in the absence of underlying illness, is highly preventable, and that routine supplementation undermines breastfeeding. However, it is important that mothers get accurate and reliable support so they can feel confident that breastfeeding is going well. There are ways to spot that breastfeeding is not going well and parents need information to recognise this. Babies who are at risk need to be quickly identified so that they can receive the extra help needed and an informed decision can be made on whether an individual baby needs supplementation along with lactation support. Urine and stool output: After birth a baby will excrete black tar like meconium, but over the next three or four days stools should become lighter in colour till they turn yellow. By the time your baby is five days old, wet nappies should be more frequent, usually six or more over 24 hours. Jaw movement: A baby needs a deep latch to be able to take sufficient milk. By watching his jaw movement a mother can see him sucking and swallowing during the feed. If there is only shallow sucking and no swallowing the whole way through the feed, the baby is probably not taking much milk and will quickly become tired. Activity: While all babies are different, and some are sleepier than others, babies who are feeding well will open their eyes and can be seen to be alert and active during the day. 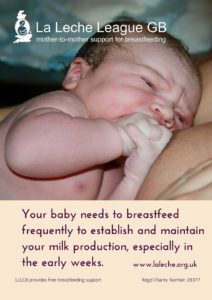 A baby who falls asleep too quickly or is hard to wake for every feed may not be taking enough milk. Frequency of feeding: If a baby is not having at least 8-12 feeds a day in the early weeks it can be a warning sign. Attachment: Improving attachment is one of the key ways of ensuring a good supply. Some babies feed well at first, even if not well positioned, because the mother has a plentiful supply. However, this could lead to a drop in production later so it’s important to get a good latch from the start. Breast compression: Using breast compression can help the baby to take more milk and increase production. Skin-to-skin and signals: If a mother holds her baby close to her body, skin-to-skin, the baby will let her know when he wants to feed. He will give signals such as moving his mouth, sucking his fists or moving his head from side to side. All babies are different: some are fast feeders, some like to take it slowly. However, in the early days offering to feed often and recognising the signs a baby is feeding well can help to reassure a mother that her milk is all her baby needs. For further information UNICEF have issued a statement about hypernatremic dehydration. This Global Health Media Project video also provides useful information: Not Enough Milk. If you are concerned about your baby seek help with breastfeeding from your healthcare team and La Leche League.